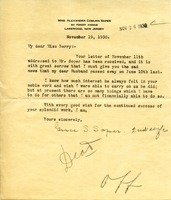 Letter from John C. Vedder, Vice President of the Bank of New York and Trust Company, to Miss Martha Berry to inform her of the death of Miss Jane E. Schmelzel. 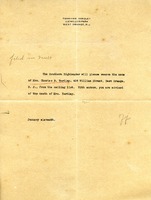 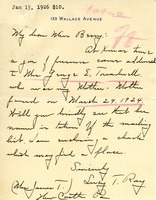 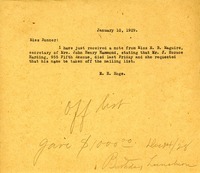 The secretary of Mrs. C. M. Knight writes to Martha Berry to inform her of Mrs. Knight's death. 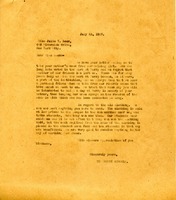 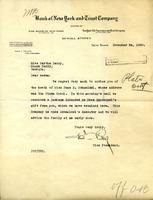 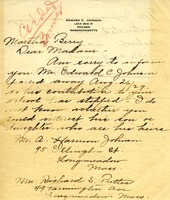 Mary writes to Martha to inform her that Mr. Edward Johnson had passed away back in August of 1929, and suggests that possibly they may be able to get in contact with his son or daughter to contribute to Berry. 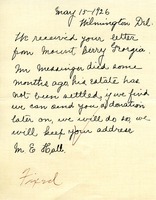 Elizabeth writes to Martha with a check for the school. 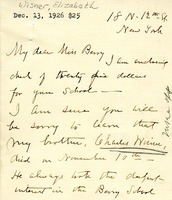 She also writes to Martha to inform her of the passing of her brother Charles Wisner, who was also interested in the school. 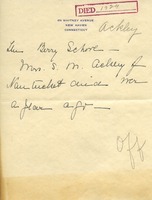 Mrs. Ray writes to Martha to remove her mother Mrs. Treadwell from the mailing list as she passed away back in 1924, and sends a small donation for the school.